1. Opening locale: A moonlit forest flanking the crimson plain beside the Lost Sea of Korus in the Valley Dor. 2. The predicament faced by John Carter's princess: Entombed in a shaft below the Temple of the Sun. 3. Length of time the princess will be imprisoned: 687 Martian days. 4. Dejah's attacker as the tomb closed: Phaidor, daughter of Matai Shang, Father of the Holy Therns. 6. Name of the son of Carter and Dejah: Carthoris of Helium. 7. The two allied forces who defeated the First Born: Helium navy airships and Thark ground forces led by Tars Tarkas. 9. Fate of the false deity: Torn to pieces by her followers after Carter revealed her deception. 10. Position of honour declined by John Carter: To sit on the throne of the First Born. 11. The new Jeddak of the First Born: Xodar -- Carter's friend and ally -- a dotar or prince who had been disgraced..
14. Carter's faithful animal companion while he waits in the Valley Dor: Woola the calot. 15. Calot description: Shetland pony size ~ hideous head and fangs ~ 10 short powerful legs ~ devoted to Carter. 16. Identity of the suspicious black man Carter is following: Thodar, an enemy whom Carter had humiliated in a fight. 17. Reason they are able to walk in safety through the dangerous Valley Dor: The ferocious plant men and white apes are in their lairs for the night. 19. Reason for the abundance of boats left along the shore: Left by the therns to facilitate the pilgrimages of Martians along Iss to "heaven" (actually to their deaths as victims of a false religion). 20. Thurid's route: Along the shores of the Lost Sea of Korus, up the River Iss to a dark portal in Gold Cliffs. 21. Horrid sight along the shores: Screaming, starving survivors and rotting dead bodies of the dead Martians who hadn't made it to the Valley Dor on their pilgrimage. 22. Identity of the party that met Thurid along the underground river tributary: Matai Shang and five therns in a longboat. 23. Reason that Carter (observing from the other side of the river) was surprised at this alliance: The black First Born and white Holy Therns are hereditary enemies. 24. Reason for Thurid and Matai's treacherous union: To plot revenge on their common enemy, John Carter and a plan to regain power. 25. Thurid's secret: He knew Issus' secret entrance into Dejah's prison. 1. What Carter observed as he followed his enemies' longboat along the underground tributary: phosphorescent rock walls and a large bejeweled cavern. 2. Difficult choice Carter had to make as he followed his enemies from a distance: To choose which of three river branches they had taken. 3. Obstacle at the end of the first stream chosen: A giant thunderous waterfall. 4. Encouraging find along the second stream chosen by Carter: The shell from a recently eaten fruit of the Sorapus Tree. 5. Carter's lucky find in an dark rock opening at the start of the rapids: The thern longboat was moored to a ledge. 7. How Woola provided invaluable assistance: The animal was able to follow Carter's enemies through the dark and along the rock tunnels. 8. What lay above these underground tunnels: The Valley Dor and the Lost Sea of Korus. 9. Information Carter overheard from two thern guards: A combination formula that allows light beams to open something. 10. Supposed reason for the guards letting Carter pass: He seemed to have convinced them that he is about to dispose of Thurid whom they do not trust. 11. Woola's reaction when Carter followed the trail suggested by the guards: The calot insisted upon another route. 12. Carter's fate if he had not followed Woola: A pivotal flagstone on the trail would have hurled him into a bottomless pit. 13. Means of illumination in the underground passageways: Radium bulbs that burn unattended for ages. 14. The warning that there is approaching danger from the rear: The clank of metal of a warrior's harness belonging to one of the two guards who followed to attack. 15. Carter's action that alerts the pursuing guards: Sneeze. 1. The therns' ability as swordsmen: Excellent -- some of the best that John Carter has faced. 3. Lakor's successful move against Carter: He pulled him down by looping a belt from his harness around his leg. 4. The fate of the two thern swordsmen: Woola crushes and slashes them to ribbons with his mighty paws. 6. Carter's disguise: Lakor's yellow wig, harness and gold headband. 7. The trap that lay in the chamber: Venomous snakes and reptiles. 8. Knowledge that saved them from this trap: They had overhead partial mention of it in the therns' conversation. 9. Unusual fact about these reptiles: The only living ones Carter had seen on Mars outside of pictures from the past. 10. Why Carter was safe in the corridor: The reptiles would not go past the line of light from the radium bulbs. 12. Main feature in the centre of the large domed apartment with marble and gold walls: The revolving column base of the Temple of the Sun. 13. Occupants of the giant shaft: The imprisoned Dejah, Phaidor and Thuvia. 14. Object found by Carter that bears the insignia of the house of Thorid: a tiny radium flash torch. 15. Problems faced in trying to enter Dejah's prison: only a small door with a pinhole which he tried unsuccessfully for an hour to open. 16. What the markings on the radium torch helped Carter recall: He had overheard Thurid mention a formula identical to those scratches. 17. What Carter discovered around the peephole: The encrustation of the carbonized electrons given off by Martian radium torches. 18. Carter's means of measuring time units of tals, xats and zodes: His Barsoomian chronometer on a band on his wrist. 19. What the following accomplished: 3 light units for 50 tals, 1 unit for 1 xat, 9 units for 25 tals: The door swung open. 21. Why Woola wouldn't ascend the stairs: He dragged Carter across the chamber and down through a rocky passage. 23. Screams of recognition from which two mouths: Woola and Dejah Thoris across the chamber. 24. Thurid's actions: Shakes his fist and drags Dejah and Thuvia away. 25. Proof that Carter's and Dejah's love is not blind: She recognized him through the maze and his thern disguise. 1. Where Carter emerged after days of struggle through glass labyrinths and underground tunnels: Beside the Otz Mountains above the Valley of Lost Souls. 2. Inhabitants of the valley below: Lost souls who had abandoned their pilgrimage to Dor and could not return to the outside. 3. Occupants of the hidden fortress he reached at dusk: Matai Shang, Father of Therns and his banished faithful. 4. Means of egress to the fortress: A triple-barred gate left ajar. 5. Carter's ruse: Posed as a thern who had come through the Golden Cliffs for an audience with Matai Shang. 6. Reason the guards let him in so easily: They were aware of his coming and were laying a trap. 7. What Carter saw in the lighted courtyard: Matai Shang and his gang with the girls on a balcony partway up a tall tower. 8. The thern's promised fate for Dejah: She is to be his wife for a year and then given to the lessers as a plaything. 9. Carter's act of contempt: Stomped on his thern wig and spit on his holy diadem. 10. Carter's shout of blasphemy to Thurid: That he had thus defiled the holy Issus before throwing her to the mob to be torn to pieces. 12. What Dejah attempted in her struggle with the guards: To join Carter in death. 13. The reason Carter didn't leap away from the banths: He wouldn't leave faithful Woola to the banths alone. 14. Reaction of the banths to Thuvia's purring musical signals. They obey her orders to not attack. 15. Carter's action: He leaped to the balcony to reach Dejah. 16. Carter's refusal that prompted the attack of three thern guards: He again rejects the love of Phaidor. 17. Carter's reason for sparing one thern guard: So he can follow him to reach Dejah and her fleeing captors. 18. Guardsman's breach of the code of honour of Barsoomian fighting men: Threw his wig and short-sword. 19. Carter's reason for climbing the 300-foot tower's dangerous outside walls to the rooftop flier pad: Interior door was barred. 20. The disaster that met Carter as he reached the roof: Thurid kicked him in the face and he plummeted downward. 1. Carter's good fortune that saved him in his fall from the tower roof: His harness caught on a stone projection. 2. The event that prompted Carter's climb back to the roof: Sound of the flier propellers growing fainter. 3. Carter's means of returning to Woola in the courtyard. He dragged a flier out of its hangar and flew down. 4. Carter's flight destination: Northeast toward Kaol where Matai Shang was headed. 5. What Carter spotted in the late afternoon: Matai Shang's flier far in the distance. 7. Places that passed below as Carter flew through the night: Hills, dead sea bottoms, deserted cities, red Martian settlements along the canals. 8. Account for the vegetation change below: They are approaching the equator. 9. How was Carter's craft disabled: Thurid blows up the forward buoyancy tanks and engine by firing an explosive radium projectile. 10. Carter's ruse that halted Thurid's attack: He feigns death by hanging by harness from the ships rail. 11. Where Carter and Woola crash landed: On the edge of a natural forest -- a rarity on Barsoom. 12. Location of the nearby land of Kaol: Along the equator halfway round the planet to the east of Helium. 13. Description of Kaol: Sunken forest area of extreme tropical heat inhabited by red men who still believe in the discredited religion of the Holy Therns. 14. What makes Kaol different and isolated from the other Martian settlements: They are not connected by a waterway (they have their own swampland) and are surrounded by hills and sea bottoms. 15. Fate of hunters who travel to Kaol to hunt their strange forest beasts: They are killed by hostile natives. 16. How Carter was able to pick up Dejah's trail again: Woola set off through the trees in the direction Matai Shang's flier had gone. 17. Reason Kaolians needed no navy: The heavy canopies of the forest hide their cities from view above. 18. Matai Shang's flier destination: A slender watchtower rising above the forest. 19. Obstacles to ground travel that Carter faced: Soft and mushy ground, 8-foot high purple, red and yellow frond-topped grasses and mazes of creepers strung between the trees. 20. Name of the plant with eyes and hands that capture and eat insects: The Martian "man-flower." 22. Why choosing to not spend the night in the trees was not a good choice: Threat of attack by surrounding man-eating beasts. 23. Place where the beasts would not venture: On solid pieces of ground covered by scarlet sward. 25. Woola's means of attack: He leaps onto the beast's head. 26. The strategy of Carter's attack: He hacked off the beast's stinger while Woola clung to its head. 27. The beast's reaction to Carter's first attack: It hit Carter on the chest with a powerful hind leg, hurling him into the forest. 28. Carter's desperate situation following his second attack on the beast: The beast held him in his jaws while he pummeled him with the stump of his stinger. 29: The nature of Carter's rescue: A red warrior mounted on a thoat attacked and killed the beast with his poisoned lance. 30. The reason that Torkar Bar, Dwar of the Kaolian Road, did not kill Carter, the trespasser: He had heard of the Prince of Helium and admired him. 31. Why Torkar Bar was in danger of instant death from Kaolian leader, Kulan Tith. He questions and disbelieves the therns and their religion. 32. Duties of a Captain of the Kaolian Road: To patrol the highways through the forest to protect travellers. 33. The name and abundance of the beast just killed: A sith -- an animal almost extinct. 34. The one-time threat no longer posed by siths: When they were plentiful, herds of them once attacked settlements from the air and carried off people. 35. Where Kaolians obtained the poison to kill siths: From two sacs just above the root of the sith's stinger. 36. What Torkar Bar saw in Kaol yesterday morning: A party arrived from the north in a small flier. 37. The promise that Torkar Bar extracted from Carter: That he contemplate no overt act against the nation of Kaol or its jeddak. 38. The order that Torkar Bar gave to Carter: That he must not admit that they have ever met. 39. Carter's disguise as he approached and circled the walls of Kaol after dark: Red pigment on his skin so as to appear to be a red Martian. 40. The city wall construction that made it impossible for Carter to scale: Ultra smooth material that slanted out for 30 feet, then perpendicular for 30 feet, and then slanted in for 15 feet to the crest. 1. Where Carter and Woola spent the night: In the forest outside the Kaolian city walls. 2. Predominant colours of the forest vegetation: Scarlet, purple and yellow. 3. Source of the noise that awakened Carter: A long line of green warriors preparing an ambush along the road. 4. Carter's main purpose in warning the Kaolians of the danger facing them: To gain entry to the city and then make his way to the palace to find Matai Shang and Dejah. 5. Carter's method of reaching the city gate as the Kaolians were about to exit: Racing on foot in mighty leaps of 30 to 100 feet. 6. Carter's unusual method of attacking the green warriors who barred his way: Frontal attack with his sword and then in the method used by the plant men of Dor he leaped above their heads, swinging his sword downward as he passed above them. 7. The green warrior Carter wished was by his side during the fight: Tars Tarkas, The Jeddak of Thark, mightiest of Martian green men. 8. The two battling forces Carter soon found himself between: Red warriors rushing out through the city gates and the savage horde of green men rushing from the forest. 9. Reaction of the Kaolians to Carter's fighting prowess: Shouts of applause. 10. Carter's boast: Fighting is his vocation and that upon two planets no greater fighter has ever lived than John Carter, Prince of Helium. 11. Significance of the name Carter uses when speaking with Kulan Tith, the Jeddak of Kaol: "Dotar Sojat" is the name given him by the Tharks many years ago -- the surnames of the first two of their warriors that he killed upon his first arrival on Barsoom. 12. Carter's promised post-battle reward: A meeting with the jeddak in the great audience chamber. 13. Purpose of the planned Kaolian mission that the green men had planned to attack: They were striking out to meet with a visiting jeddak from the north. 14. Reason for Carter's and Woola's rapid recovery from their wounds and long travel ordeal: The marvelous Barsoomian healing salves and a good night's rest. 15. The story Carter gave the jeddak after being congratulated: He is Dotar Sojat from the city of Hastor (he actually has a small palace there) in the south of the Heliumetic nation. His flier had been wrecked on the edge of the forest and he had come seeking help in Kaol when he came upon the trap. 16. Familiar faces in the audience who apparently did not recognize Carter in his disguise: Matai Shang and Thurid. 17. Part of the jeddak's praise for Carter that aroused the suspicion of his enemies: Carter's agility, leaping fighting style and calot companion. 18. Circumstance that prevented Carter from immediately looking for Dejah and Thuvia: Kulan Tith asks him to accompany him on the royal procession to meet the arriving visiting jeddak. 21. . . . Wheeled vehicles: One thousand zitidar-drawn chariots filled with women and children of the royal court, escorted by mounted warriors. 22. . . . The draught animals: Mastodonian zitidars -- seldom used by red men -- decorated with jewels and silk and ridden by Martian youths. 23. . . . Force bringing up the rear: Mounted spearmen, riflemen and swordsmen. 24. The jeddak's place in the procession: In front of the chariots. 25. The jeddak's special mount: He rode on a pure white thoat -- a rare beast. 26. Reasons for the relatively noiseless advance of the huge procession: Thoats and zitidars are hoofless and the broad tires of the chariots are of an elastic composition. 27. Types of noises that came from the procession: The clanking of accouterments, occasional squeal of an angry thoat, the low guttural of a zitidar and gay laughter and chatter of the women and children. 28. Person Carter suspected of following him after the evening banquet back at the palace: A thern spy. 29. Where Woola must spend the night: A comfortable apartment in the stables of the royal thoats. 30. Events that awakened Carter: Someone rubbed something cold and clammy across his forehead followed by the entrance of guardsmen who escorted him to Kulan Tith. 1. The three personages on the dais awaiting Carter as he was escorted into the great audience chamber: Kulan Tith, Matai Shang and the visiting jeddak. 2. The evidence that Thurid, the accuser, presents against Carter: The white-skinned earthman's disguising red pigment was wiped from his forehead while he slept. 3. 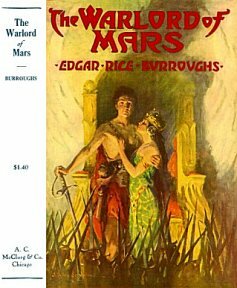 Accusations presented by Thurid and Matai Shang: Carter desecrated the temples of the Gods of Mars and turned the world against its age-old religion. 4. Matai Shang's explanation as to why Carter has followed him to Kaol: To assassinate him. 5. Kulan Tith's order: Carter the blasphemer and assassin is ordered to be imprisoned in the pits. 6. Carter's reaction: He strikes Thurid down with a fist to the face and turns to do battle with the guardsmen. 7. The man who came to Carter's defence: The visiting jeddak, Thuvan Dihn, Jeddak of Ptarth. 8. Why he had broken all protocol to come to Carter's aid: Carter had rescued his daughter from Matai Shang and had exposed the false religion -- he recognizes him as an honourable man. 9. Kulan Tith's compromises. . . the Carter solution: Carter will be escorted safely from the land of Kaol. 10. . . . the dispute between Thuvan Dihn and Matai Shang: They must settle their dispute outside of Kaol lands. 11. Carter's explanation for following Matai Shang: To rescue his princess, Dejah Thoris and Thuvan Dihn's daugher, Thuvia. 12. KulanTith's order to Matai Shang: Return the two women who had arrived as Phaidor's slaves. 13. Matai Shang's response: On his honour he promised to present the two women by morning. 13. Tragic news brought by the messenger sent to fetch Matai Shang and the women: Matai Shang's party has escaped from the palace. 14. The suspected destination of Matai Shang: To the far north where there is still a race of people who are faithful followers of the therns and their religion. 15. The means by which Carter and Thuvan Dihn take up the pursuit of Matai Shang two days later: Carter's flier that they retrieved and repaired. 1. Fate of all previous fliers and expeditions that had passed beyond the ice-barrier around the north arctic region: None ever returned. 2. The name that Martians have given to this mysterious northern region: "Forbidden Land." 3. Reasons for Carter's slow night flight as he approached the ice barrier: Wary of a trap they were flying a few feet above the ground also the darkness caused by the moons having set and the clouds which are found only in the polar regions on Barsoom. 4. Cause of the collision: A towering wall of ice and rock. 5. Problems now faced: They were up against an unscalable wall of ice and granite and surrounded by deep snow and extreme cold. 6. Difficulties presented over the next five days: They met cold, suffering and privation as they trekked along the base of the ice barrier, looking for a way through -- and they were constantly attacked by fierce, fur-bearing creatures. 11. . . 2 upper limbs: grow forward from the shoulders on either side of its long, powerful neck, terminating in white, hairless hands, with which it seizes and holds its prey. 13. . . Tusks: From the sides of the lower jawbone two mighty horns curve slightly downward toward the front. 16. . . Habitat: They live in the dark subterranean recesses in the ice and roam the ice field surface attacking every living thing they meet. 17. . . Behaviour of the Beast: They are in a perpetual rage and kill for pleasure even when their bellies are full. 18. The reason for the unusual behaviour of the apt that didn't attack them: It appeared to be domesticated, having a golden collar around its neck. 19. What is known about the inhabitants of the north pole: They are possibly the fabled yellow men of Barsoom -- a once powerful race which is thought by many to be extinct. 20. The unusual feature in the barrier to which the apt's trail leads: A large mouth of a cave. 21. The source of the stench that meets them: It is wafting from the fabled Carrion Caves. 22. How and why the stench is perpetuated: To keep ward off enemies, the yellow men pile their dead and anything that will rot at this only entrance to their fertile valley beyond the ice-barrier. 24. The secrets that Carter felt this land might hold: The mystery of the disappearance of Tardos Mors and Mors Kajak. 25. Dangers encountered in the eighth cave they enter during their passage: An apt lair with 20 beasts -- many of them sleeping. 26. Carter's suggestion refused by Thuvan Dihn: That Thuvan Dihn and Woola turn back and bring help, while Carter stays to find a way through. 27. The messenger sent for help: Woola is ordered to deliver a note to Carthoris in far-off Helium. 28. Carter's directions given to Carthoris: Bring a large force to enter through the ice caves and make no attempt to take the fleet across the ice barrier. 29. Carter's reason for showing himself to the apt sentry: To draw it into a trap so as to behead it. 30. Their plan after killing the apt sentry at cave number eight: They sneaked through the cave past the now sleeping apts. 31. The two main weapons carried by Carter: A long-sword and a short-sword. 32. Probable event that created the ice tunnel through the barrier with its series of 27 connecting chambers. Meltwater flowing through the ice and rock barrier on its way to the south. 33. Why this was a fortunate day to make this journey: This was the only day of the month the apts they gathered in one chamber to mate and sleep for a full day. 34. What they came upon as the trail started to descend to the valley: A party of six yellow men of Barsoom waiting the approach of a solitary warrior. 35. Appearance of the men: All are fierce and black bearded with skins the color of a ripe lemon. 36. The men's costumes: Six in the black and yellow striped hide of the orluk. The man approaching wore the pure white hide of an apt. 37. Weapons carried by the men. . . Sword 1: a sharp-edged blade with a complete hook at the far end and held in the left hand. 38. . . . Sword 2: Straight and two-edged with a length between that of a short- and long-sword and held in the right hand..
40. . . . Weapon hung on the left arm: A cuplike shield the size of a dinner plate with the concave sides turned outward toward an antagonist to ward off hooked swords. It was held rigid on a metal bracelet above the wrist. 41. . . . Weapon attached to the harness: A dagger. 42. Sound from the six attacking yellow men: Fiendish yells resembling Apache war cries. 43. Purpose of the hooked sword: To pull opponents close enough to impale them with the other sword. 44. One reason John Carter jumped in to aid the lone warrior: He could not stand idly by and see a brave man butchered by superior numbers. 45. The second reason Carter came to the warrior's defence: He always loved a good fight.